Tonight (Wednesday) is the biggest bar night of the year. So they say. The Wednesday before Thanksgiving. When most or a majority of folks are staying with relatives. Traveling some sort of distance to spend a day or the whole weekend (4 entire days) with loved ones. In close quarters with brothers and sisters. Niece and nephews. Aunties and Uncles. Adults find themselves in bunk beds or camped out on their parent’s living room floor wrapped up in a New Kids on the Block sleeping bag from elementary. Yeah, sometimes you need a drink before that happens. Reason 1, why the Wednesday before Thanksgiving is a busy night at the local watering hole. Reason 2? Old friends. Catching up. Rehashing. Laughing. Remembering. Having a cold beer with people who knew you in 4th grade. When turtle necks and stirrup pants were the fashion. Friends that you passed notes with in study hall. Or played MASH with on the bus. While we may have dispersed, all going our separate ways, leading our own lives…the Wednesday before Thanksgiving brings most of us back home. Prompting an impromptu reunion of sorts. Having to cook a dinner for a crowd. Hosting Thanksgiving. If I had to do all the cooking for 15 people…once the house was clean, the prep work complete, and the turkey submerged in a brine, because you refuse to serve a dry bird, a drink would be needed and deserved. Reason 3. Since I will not find myself at a bar Wednesday night, I wanted to share with you a cocktail I enjoyed Tuesday night. A night early. I spent last night baking this chocolate tart and an apple pie and mixing up an obscene amount of puppy chow. Baking and cocktails…my kind of evening. Oh! and Mark Harmon, he was on TV, not sitting at my kitchen island enjoying a Manhattan. Total bummer. 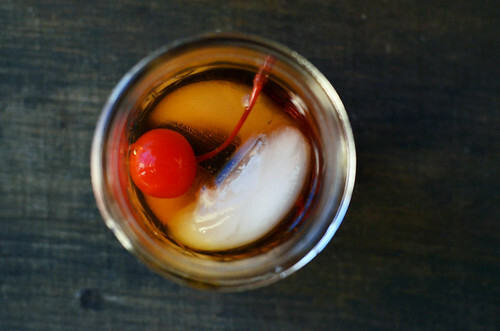 Anywhoooo….yes, I made Manhattans. 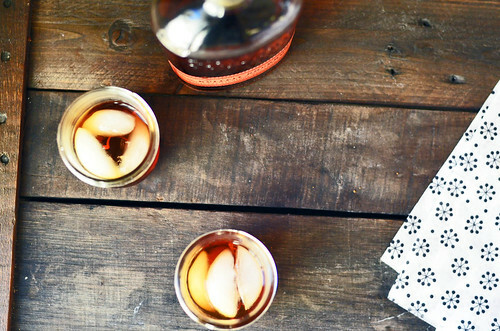 Not a drink for the faint of heart or for those that aren’t in love with whiskey. Because it is whiskey and vermouth and bitters. That is it. Simple and straightforward. 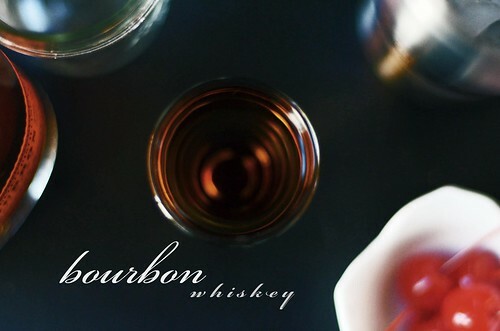 Bourbon whiskey is what I had laying around, but rye whiskey is more traditional…however, both get the job done. However, if you use scotch whisky it is considered a Rob Roy. There’s a Wednesday cocktail fun fact, for ya. Safe travels to those that are hitting the road today and over this long holiday weekend! 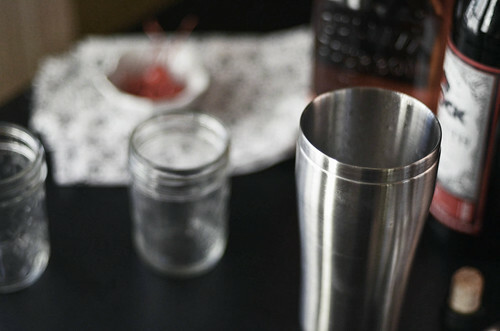 Combine whiskey, sweet vermouth, and bitters in a mixing glass with several ice cubes. Stir to combine. 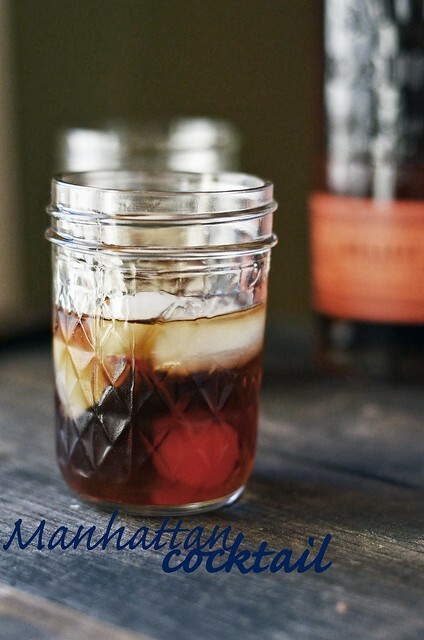 Strain into 2 cocktail glasses, or tumblers, or mason jars, or jam jars, or a low ball glass...you get the idea. Garnish with a maraschino cherry and perhaps an orange peel.